This has been a very popular boat for Carver for many years because of its spacious one-level interior, huge bridge that seats 12, and the large open cockpit. 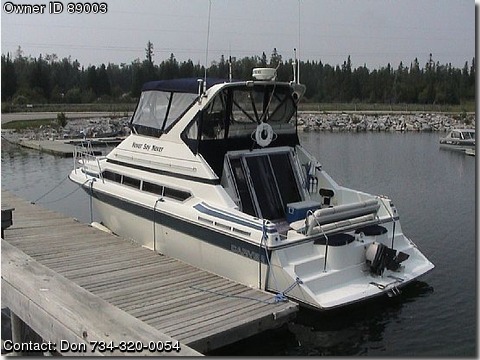 This boat is ideal for entertaining large groups, weekend sleep overs and long-term cruising. It has a full galley, redecorated head with a Tecma toilet & roomy shower, sleeping accommodations for six including a spring mattress in the forward stateroom, and a large comfortable salon. This is a very clean boat with low hours on new engines. Many upgrades and factory options provide tremendous value for the captain looking to step up to the next size. The LOA of 41' 10' (38' 5" w - o pulpit), 13' 2" beam, and 42" draft provide a craft that can withstand the roughest seas and maneuver into the most scenic coves with no problems. This well cared-for boat has recently had a complete bottom paint strip with 6 coats of epoxy barrier coat and 3 coats of new bottom paint. The boat has been stored inside a heated building during the winter months and has been rubbed out and polished yearly. New Nova Kool 9.1 cu. ft. ac/dc refrigerator installed 9/15/10. The boat has a complete instrumentation including radar and autopilot. Too many additions and options to list the boat must be seen first hand.